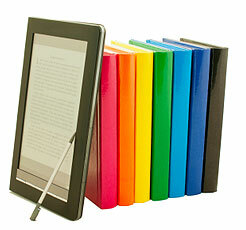 Horizon Real Estate offers these free real estate eBooks to assist you with your Real Estate needs. For more information on these, or any real estate topic, call us at 619-741-0111 and we will be happy to specifically address your needs. 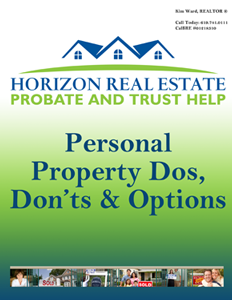 This ebook addresses the question of what to do when you’re the executor of an estate. Everyone has personal belongings such as baby pictures, a favorite afghan or a casserole dish that hold memories for them and their family members. Passing on to family members these treasured items of the San Diego decedent can be challenging, and may lead to family conflict. 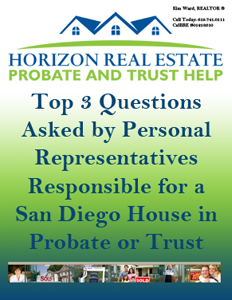 Top 3 Questions Asked by Personal Representatives Responsible for a San Diego House in Probate or Trust is an important read for anyone serving as executor of an estate, regardless of whether you’re in San Diego or not. This ebook gets right to the point of these Top 5 Questions. It’s a quick read that will leave you feeling ready for the next step. 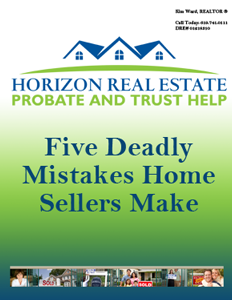 Read this free eBook and avoid making these mistakes in your Real Estate transactions. 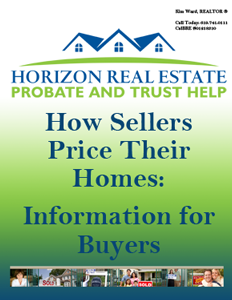 This free eBook is a must-read for anyone thinking about selling their home! Packed with great information, the topics discussed range from Real Estate Agent v. Realtor® to seeing things from the Buyer’s point of view. 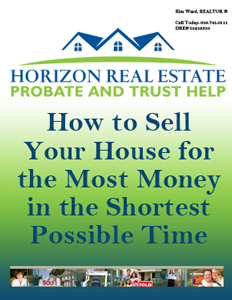 This great eBook will teach you the keys to selling your house for the most money. Learn the 3 things most buyers are interested in about a property they’re considering. This free ebook is especially helpful for sellers to see their homes the way buyers will and decide what changes should be made before listing. My friend, Kathryn, called me after her home was burglarized. In her case, most of the missing things were items that could be used in identity theft: passports, bank statements, social security cards and birth certificates. The California Homeowner Bill of Rights became law on January 1, 2013 to ensure fair lending and borrowing practices for California homeowners. Go to: https://oag.ca.gov/hbor or click to download a PDF. From the first meeting with your real estate agent to your moving day, this flow chart will assure you stay on track. A credit score is derived from a model that analyzes a number of variables from a consumer’s credit files to determine the likelihood that the applicant will repay the loan on time. From Appraisal to Veterans Administration all the real estate terms you’ll need to know. Use this checklist to make sure you’re prepared for your loan application.